With just two months left in DC’s year long maxi-series Brightest Day, issue #20 turns its attention to the second half of the Aquawar with Aquaman leading a team of heroes and dead fish against Siren’s forces from another dimension and Black Manta. 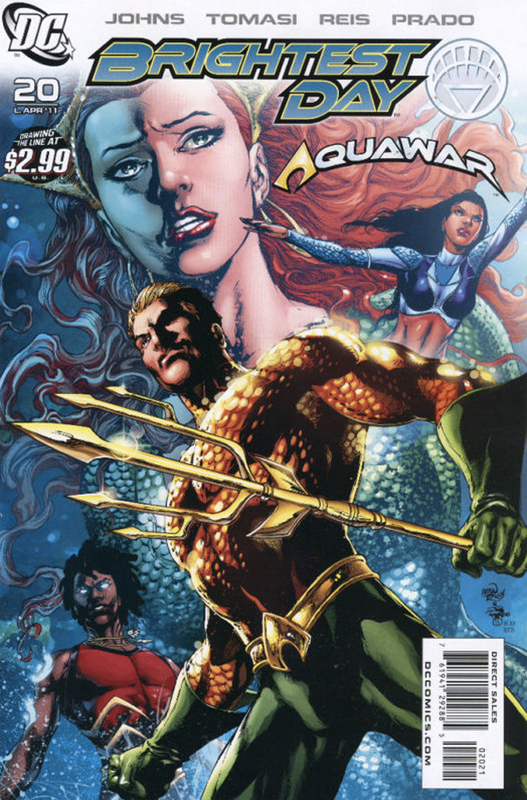 Aquaman, Aqualad, Aquagirl and especially Mera each get nice character moments in which they shine. In addition, we learn how Siren escaped into our dimension in the first place and get a few preview pages from the upcoming War of the Green Lanterns. KevinMLD: I thought overall this was a pretty strong conclusion for Aquaman’s subplot. There were some great moments such as Mera moving the entire ocean Moses-style. PTB: Mera controlling the ocean was epic. This moment made her something special in my eyes. I liked what they did with her and the Red Ring in Blackest Night, but this was awesome. I know we thought Black Manta came off with the big push here, but Mera might be the real winner. KevinMLD: You may very well be right about Mera. She definitely stole the show in Blackest Night and we could end up seeing the same thing here. Since we know no one will ever read an Aquaman comic, I wonder if they could sneak one by readers by having Mera be the star. 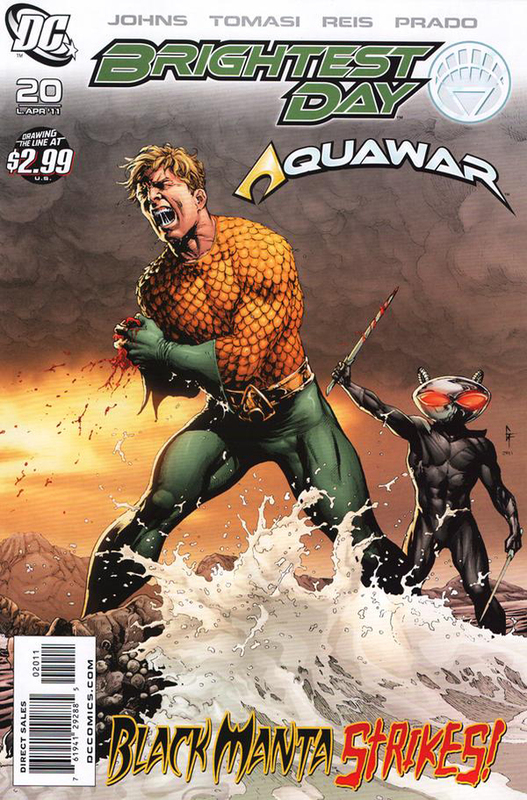 Once again, the White Ring “returns’ the life of a hero only to immediately kill him after completing his task as Aquaman appears to die on the last page of the issue. This is odd since the villains who have had their lives returned (Max Lord and the Reverse Flash) are still alive. This cements for me the fact that the Hawks are not really dead and will be coming back to life again very shortly… (At least until DC kills them again in Flashpoint). Is this another White Ring murder tied to love? Could there possibly be a rivalry between the White Ring and the Star Sapphires of which we’re not yet aware? PTB: The “death” of Aquaman was kind of an afterthought here. Clearly these heroes aren’t dying… or they were never truly alive. With the Hawks, they resisted the White Lantern’s wishes. Nothing like that happens with Aquaman, but he was expressing his love for Mera. It’s an intriguing idea that the White Lantern may be blocking the power of love to control the Star Sapphires. Is that Predator entity we saw a few issues ago something that could be at the center of this? KevinMLD: I doubt it’ll tie to the Predator entity directly since the entities have their own story going on over in the pages of Green Lantern leading into the War of the Green Lanterns. But there definitely might be something to this love angle. Also, I’m reminded that the Orange Lanterns are projections of people Larfleeze killed. Maybe there’s something vaguely similar happening with the White Ring. PTB: We brought that up after the Hawkpeople were turned to dust, thinking they may have been taken into the White Ring to be deployed later to help the Protector. Possibly against Deathstorm’s League of Black Lanterns which he has the power to summon. You mentioned the villains that were returned to life by the White Lantern. Captain Boomerang (who we saw in issue #18) is on that list as well. Only Max Lord has completed his mission, correct? Making him the only one to do that and not be “killed” by Deadman as far as I know. KevinMLD: No. The Reverse Flash completed his mission as well and I think Black Adam Jr. or whatever his name is… Osiris… had his life returned to him in the most recent issue of Titans. So we’re left with Captain Boomerang, Hawk, Martian Manhunter, Deadman, Jade and Firestorm who are yet to complete their task. Now that I think about it, I don’t read Justice League or Justice Society anymore so it’s possible Jade has already finished her task as well. I don’t love the idea that once again in a new, shorter, cheaper DC comic, five pages were devoted to showing just three panels when you take into consideration the double page spreads and splash pages. However, since most of the other pages were packed with panels, this issue felt like a fuller issue than #19 did. PTB: There was definitely better pacing here. It still felt a little short though. The pages leading into Mera’s wall of water felt particularly dense with panels and some of the detail in the art was lost while overall it was another great looking book. As cool as that moment was, I have to mention the sharks made of water? Really? You can pull off a stunt like the one we mentioned earlier, make water into weapons of any shape, and you choose fish? KevinMLD: I agree that the water sharks were lame, but on the other hand, how cool looking were the splash pages of Aquaman’s undead shark army? PTB: The dead fish army looked great and really epitomizes Aquaman’s resurrection story. I liked seeing it all tied together visually like that. KevinMLD: By the way, how far is Miami from the Bermuda Triangle? It seemed like Siren’s forces were pushed back amazingly quickly. PTB: The Bermuda Triangle’s points touch land at Bermuda (obviously), Puerto Rico and Miami. It’s not such a stretch that they could repel them in short order from what I can tell. KevinMLD: Interesting. I had no idea. PTB: I was glad to see David Finch back on covers after the brief transition to Gary Frank. This cover really captures the brutality of the moment it depicts if not the crowd/scene. KevinMLD: The cover definitely was nice but some of the interior art looked a little silly, especially Aquaman’s stump which was just completely flat on a few early pages. PTB: That was one clean cut. I’m a little surprised Manta wants to kill his son, Aqualad. I wasn’t getting that from what we saw earlier at all. KevinMLD: This obviously ties back to Manta having previously killed Aquaman’s child. I think this series has established Manta just likes killing people. PTB: Aqualad’s powers are described as electrical to some extent in this issue. That’s not very practical in the water. He uses them to repel Manta and Siren’s forces, but how does the Aquateam survive that? KevinMLD: No idea. I don’t think they’ve established his powers very well yet. I’m sure this will all be explained at some point. PTB: Is this new Aquagirl as new as Aqualad? I know we talked about her cameo in issue #18, but how new is she? I have to admit, I like her costume. It’s much better than Aqualad’s. KevinMLD: I don’t believe she’s new. I think she’s been running around for a little while, but since no one cares or reads about Aquaman, no one noticed. PTB: I really liked the preview for the War of the Green Lanterns. Honestly, this is what I’ve been wanting to read about all along. Even during Blackest Night, I feel like the story I was most interested was happening in the Green Lantern titles. KevinMLD: I think this is definitely the case. You’d probably prefer all three Green Lantern titles to Brightest Day. In fact, this week’s issue of Green Lantern Corps jumped right out of Brightest Day and featured Firestorm on Qward looking for Deathstorm and getting caught up in a battle between the Sinestro Corps and the Green Lantern Corps. It was a decent issue, but it ends with Firestorm asking the Green Lanterns including Ganthet and Kyle Raynor if they had seen the Black Lantern version of himself around because he believes Deathstorm is on Qward. The Lanterns reply, “No” and that they’re too busy to help stop a threat from these Black Lanterns. Really? You’re too busy to confront a force that just months ago threatened to destroy all life in the entire universe? It was a comically terrible ending to an otherwise good story. PTB: That’s abysmal. I like that they connected the two stories, but that resolution makes no sense. How can they dismiss the Black Lanterns after what everyone just went though? It also seems to assume that everyone reading Brightest Day is reading all of these books. We’ve seen it all along with Generation Lost, but I really don’t like that practice. KevinMLD: In this case, I think they tried to avoid letting anything happen in the Green Lantern Corps title that would impact the Firestorm subplot in the main Brightest Day title. I’m guessing the events of this issue will be largely ignored when Brightest Day turns its focus back to Firestorm.